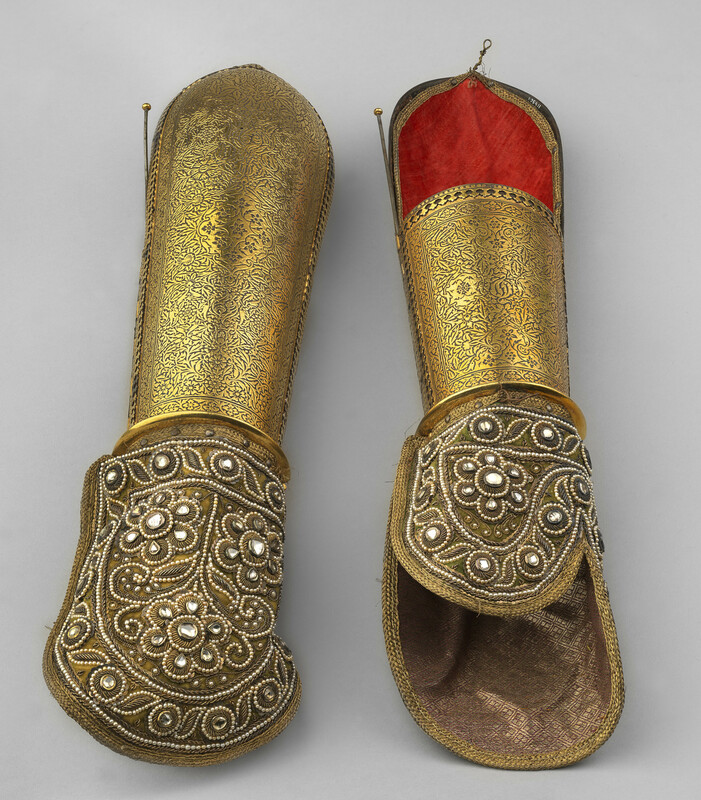 A pair of steel armguards or dastana overlaid with gold patterning of floral designs with trefoil borders. This technique of gold decoration on steel is known as kuftkari and these armguards are a particularly fine example of the technique. The gauntlet made of green velvet encrusted with diamonds, pearls and gold thread embroidery called zardozi. The gauntlets lined with pink silk. The armguard held together with hinge pins and two buckles with straps. A combination of textile and steel plate armour was worn as armour in parts of India as textile allowed for freer movement and was more comfortable to wear in the Indian climate. However, this pair of armguards made with luxurious material is designed for ceremonial wear.